Jonathan Maus is Portland, Oregon’s premier news source for all things related to bicycling through his blog at BikePortland.org. 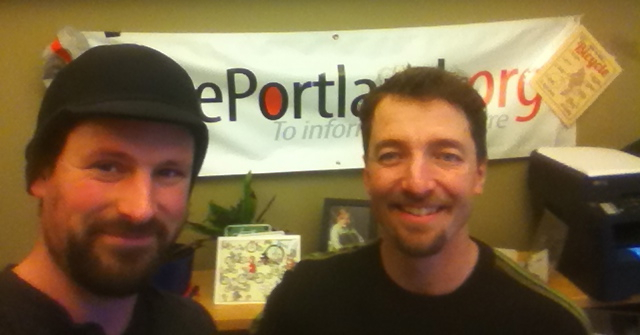 We spoke last week about the good, the bad, and the upcoming in Portland’s bicycle cultures and communities. Brock also learns that he’s recently gluten-conscious and a fan of Harvester and Omission gluten free beers! Also, Brock & Aaron chat about the completion of bike work, car2go & cab rides, and how hybrid buses don’t rumble. Qualcomm takes a try at improving the transit experience. Pro or anti transit? Oregonian: Is a passenger-rail renaissance picking up steam in Oregon and Washington? JohnnyK shares a generous donation and says we are rockstars. That’s debatable, but we are grateful nonetheless!